Around mid-Nov we get our Christmas trees in and ready for your home or office. 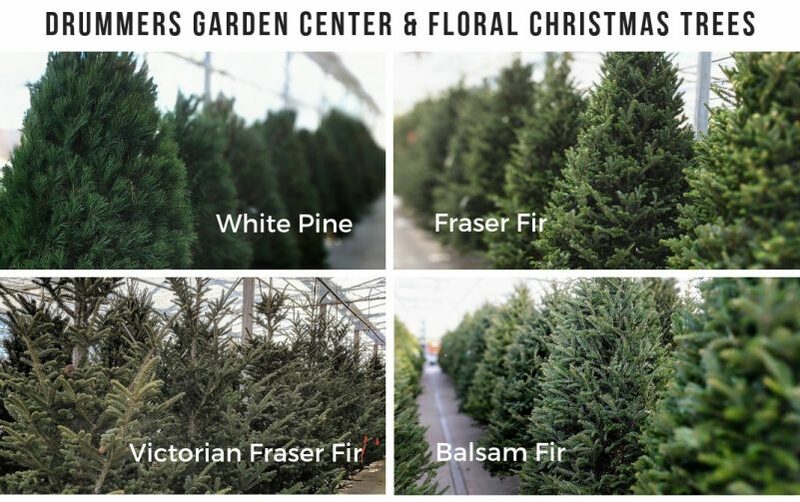 We carry four varieties plus “Charlie Brown” trees that are the shorter, unique, and untrimmed trees. White Pine: Size ranges from 6′-8′ tall and have soft, flexible needles that are bluish-green in color. Needles are 2½ – 5 in. long. Not great for heavy ornaments. They have good needle retention. These trees have little fragrance. Fraser Fir: Size ranges from 6′-12′ tall and have good form and the best needle retention of all the varieties. The branches are slightly upturned. Has a pleasant fragrance. Our most popular tree! Victorian Fraser Fir: Size ranges from 6′-14′ tall and are untrimmed and space between branches are wide. This is a more traditional old style of Christmas tree. Sometimes they are still adorned with little cones on them. Good needle retention. Balsam Fir: Size ranges from 5′-12′ tall. These Christmas trees have the strongest and longest lasting fragrance of the tree varieties. These are relatively dense trees and have two toned needles with dark green on top and silvery green on the bottom.